, an eminent Greek scholar and commentator, was born at Hamburgh, Dec. 29, 1699. At the age of thirteen, he went to a village called Dabha-usen, or Taubhausen, near the town of Griefenstein, where there was then a French colony, to learn that language; and made so much progress within seven months, that it appeared to be his native tongue. 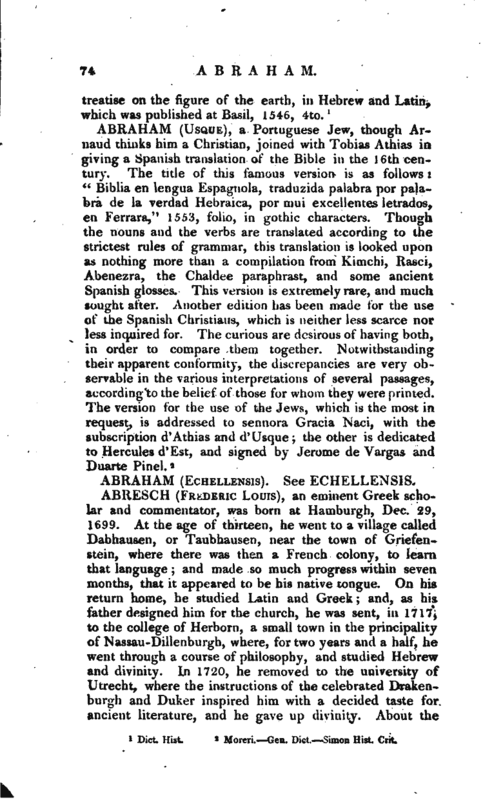 On his return home, he studied Latin and Greek; and, as his father designed him for the church, he was sent, in 1717, to the college of Herborn, a small town in the principality of Nassau-Dillenbuvgh, where, for two years and a half, he went through a course of philosophy, and studied Hebrew and divinity. In 1720, he removed to the university of Utrecht, where the instructions of the celebrated Drakenburgh and Duker inspired him with a decided taste for ancient literature, and he gave up divinity. About the | end of 1723, when he had finished his studies at Utrecht, and wished to go through the same course at Leyden, he was appointed vice-director of the college of Middleburgh. In 1725, he was promoted to be rector ofthe same college; and, in 1741, he filled the same office in that of Zwol, in Over-yssel, where he remained until his death, in 1782. Biographie Universelle, 1811.—Dr. 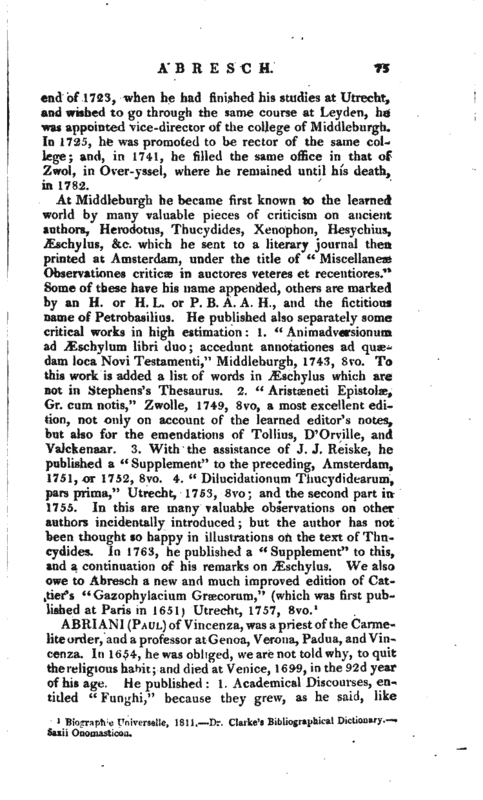 Clarke’s Bibliographical Dictionary.— Saxii Onomasticon.